Automatic station search function does not stop. Automatic station search function stops on a station. Optional components are not installed. (1) Remove the roof antenna pole sub-assembly from the satellite radio antenna assembly (w/ SDARS System). (2) Remove the roof antenna pole sub-assembly from the amplifier antenna assembly (for Roof) (w/o SDARS System). (2) Turn the radio and display receiver assembly on and enter AM mode. (3) Place a screwdriver, thin wire or other metal object on the threaded portion of the satellite radio antenna assembly for installation of the roof antenna pole sub-assembly and check that noise can be heard from the speakers (w/ SDARS System). 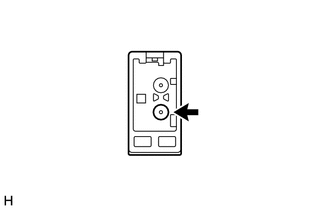 (4) Place a screwdriver, thin wire or other metal object on the threaded portion of the amplifier antenna assembly (for Roof) for installation of the roof antenna pole sub-assembly and check that noise can be heard from the speakers (w/o SDARS System). (1) Disconnect the antenna connector from the radio and display receiver assembly. (a) Disconnect the RA radio and display receiver assembly connector. (b) Proceed to the next step based on the inspection result. 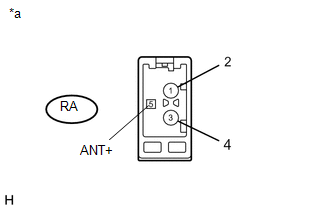 (a) Replace the amplifier antenna assembly (for Roof) with a new or known good one and check if radio broadcasts can be received normally (See page ).